A lovely petite c. 1860 view of San Francisco by W. L. Ormsby. 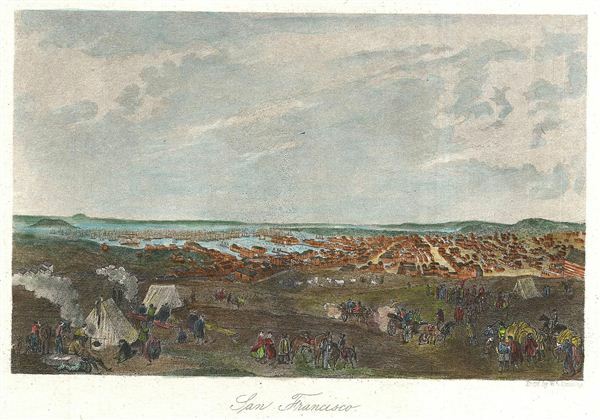 This small but beautifully view shows the city and Harbor of San Francisco with military in the surrounding hills. This was engraved at the height of San Francisco's population boom just following the California Gold Rush. Drawn and engraved by Waterman L. Ormsby. Ormsby was an engraver, counterfeiter, and artist living in San Francisco in the mid-19th century. He was prolific and had few qualms about the engraving contracts he accepted. His works is universally of high quality and appears on guns, bank notes, counterfeit bank notes, wills, deeds, leases, stock certificates, and in numerous books.